Your neck is a complex structure made up of the vertebrae and the joints and discs between them, and the muscles and ligaments that hold it all together. Any one or more of these structures can be injured.You can strain or sprain ligaments or muscles with sudden, improper or repetitive movements. You can even sprain a disc causing a bulge that can irritate a nerve. These injuries can result in days of acute pain and swelling in the injured tissues, followed by slow healing and a gradual reduction in pain. The pain may be felt in the neck, head (as headaches), shoulder, or down the arm. It may even be felt primarily in the shoulder, arm or hand with very little pain in the neck itself. To ensure you get the right treatment it’s critical these signs & symptoms are differentiated from shoulder, arm or hand pathology- so a thorough Osteopathic assessment, sooner rather than later, is always your best option. 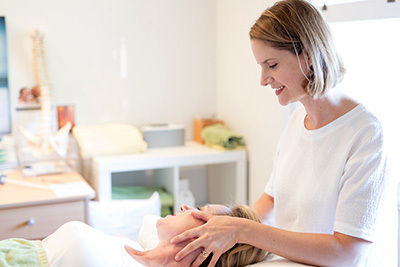 At West Perth Osteopathy we use hands-on treatments to help to reduce neck pain, stiffness and discomfort, improve recovery time and promote blood flow and healing. We can also assess you to determine how we can use strengthening exercises to reduce the likelihood of recurrence or the frequency of recurrence in more chronic cases. We can also help you correct posture and improve nerve function if these are factors in your pain.